This discussion is going amusingly around in circles. What are the chances we see all of the proposals? Is this the type of thing where they are released publicly, or was this just a leak and we'll only see the chosen proposal? The concept in the render below * reminds me to the "Piazza Gae Aulenti" in Milan (check out on Google images). They've integrated the Garibaldi train station with several glass towers (in a curved-circle formation), featuring water fountains, movie theatre, shops, and restaurants. If done right, a transit hub can be classy & an attraction, rather than a hangout for homeless around fast food restaurants. Keep in mind, this isn't a transit station, that's across King. Though, it does make you wonder, could a King's Crossing development arrange to work with the rail corridor sufficiently so as to allow it to integrate with the GO/Via/rail platform as seamlessly as the Intermodal Hub site? With 12-car GO trains, if they place the platforms just right they could probably pull it off. As it is, the southbound LRT platform will connect to it almost directly. The platforms are designed to stretch across the King overpass and end just on the south side. This will allow steps/elevators to access that side of King, mainly for the southbound Ion platform, but this development could benefit as well. Spoilers: the "retaining wall" (as it's been called in this thread) means you won't see this particular proposal being built, as it's somewhat unfriendly to foot traffic. But there's a few others up for consideration (and that's not to say the individuals behind this can't change it). You would think that would be obvious, though. Wouldn't architects know that it would be rejected for a detail like that? Or are they so focused on creating their own little world (actually though. Just a bunch of internal facing living and commercial units intended to be oblivious to their surroundings or outside visitors), that they don't even consider it? Such oversight should be impossible for any architect to make, kind of the antithesis of their work. (02-04-2016, 07:44 PM)ac3r Wrote: [ -> ] Spoilers: the "retaining wall" (as it's been called in this thread) means you won't see this particular proposal being built, as it's somewhat unfriendly to foot traffic. But there's a few others up for consideration (and that's not to say the individuals behind this can't change it). That's not to say that this particular proposal can't be redesigned, though. It's a really minor thing. The firm I work for doesn't develop in Waterloo Region unfortunately so we don't have any plans for here. However, personally, I'd push the wall back/inset it in a bit, then simply add a glass facade/interior as the retaining wall, which could house a sort of lobby area with patios/greenery/store fronts inside (especially as Kitchener prides itself on having a ton of gardens downtown). It would look a lot nicer! Something like this but with nice gardens/trees inside as in the famous Ford Foundation building although perhaps not quite as tall/grandiose. (02-10-2016, 08:29 PM)ac3r Wrote: [ -> ] Something like this but with nice gardens/trees inside as in the famous Ford Foundation building although perhaps not quite as tall/grandiose. I do like the concept, it would be good. Given that it's Kitchener, maybe we should replace the trees with cotone asters though! If anyone is interested, SSP (Canadian City Proposals) has more concept renders for this project, along with some discussion, in today's posts. Looks like another proposal that gives no consideration to people walking down King. 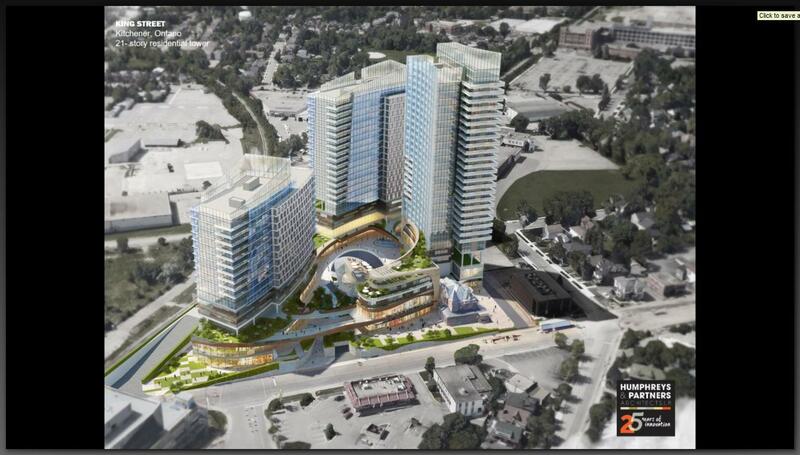 I think it's just more renders of the same proposal. (04-06-2016, 01:03 PM)taylortbb Wrote: [ -> ] I think it's just more renders of the same proposal. I think so, too. Hopefully it will improve yet. That said, neither one of the two retaining walls is really that long. Not perfect, but I could certainly accept it if the project is otherwise fantastic.